Agriculture Minister Uri Ariel meets with Chief Rabbinate Council, calls on other ministers to cut number of permits to work on Shabbat. 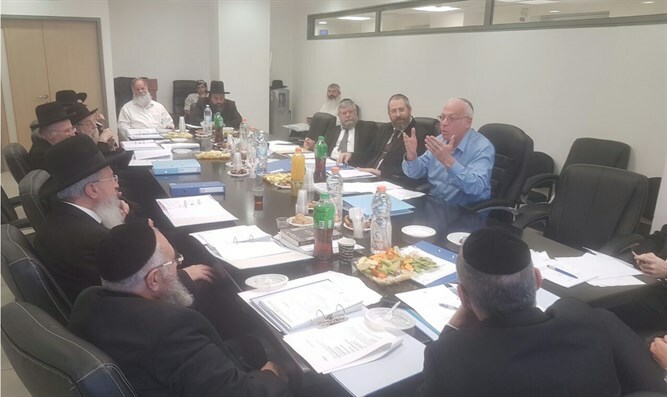 Agriculture Minister Uri Ariel (Jewish Home) attended on Monday a meeting of the Chief Rabbinate Council. The meeting was held to discuss the issue of businesses which are open on Shabbat (Sabbath). Ariel said, "When I began my term as Agriculture Minister, I found there were around 50 permits to work on Shabbat. I therefore worked to reduce that number to 7 permits only. "I intend to turn to the members and heads of other offices and request they also attempt to reduce the number of people allowed to work on Shabbat. "I see the Chief Rabbinate Council as the highest religious body, and therefore I am asking you to advise me," Ariel concluded. At the end of the meeting, Chief Rabbinate Council President and Chief Ashkenazic Rabbi David Lau said, "We must insist a representative of the Chief Rabbinate Council sit on the board which gives these permits." The issue of working on Shabbat has come up several times recently, with the haredi parties claiming they will quit the coalition if businesses are open on Shabbat, and the Managerial Committee allowing the some Tel Aviv businesses to remain open on Shabbat.